This IBM Redbooks publication will help you install and customize Siebel 2000 V6.1 applications for OS/390 V2.8 using DB2 V6.1. It is based on the installation experiences gained while installing Siebel 2000 at the IBM-ITSO in Poughkeepsie, New York. The book contains an overview of Siebel Systems and their two- and three-tier architectures in the OS/390 environment. It describes the connections to the Siebel-DB2 database server on S/390, the customization needed for OS/390 and DB2. 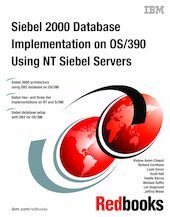 It provides installation guidelines to set up the Siebel applications on NT servers and the database on the S/390 server. The book gives recommendations on security and database administration issues, as well as the DB2 features which specifically benefit Siebel. An example of importing data to the Siebel-DB2 database, using Siebel’s Enterprise Integration Manager, is also provided. This book will be especially useful for those installing Siebel 2000 on OS/390 for the first time.